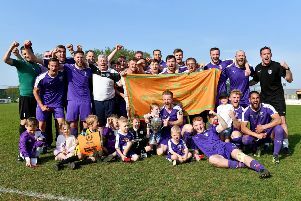 Super-sub Chris Gilligan hit the late winner to cap Daventry Town’s comeback in the United Counties League. Town trailed 2-0 at the break in Saturday’s division one clash with Bourne Town but showed great character to win it 3-2 with three second half goals from Aaron King, Adam Creaney and Gilligan. With Dean Lukeman still suffering from the injury that forced him off last Saturday, utility man Sam Heavey dropped to the back with the returning Adam Confue returning to central midfield. Damon Herbert also returned to partner Ross Harris. Town saw plenty of the ball in the opening spell, Creaney firing just over the bar just before Confue had a fierce drive saved well by Alex Brown. But it was the visitors who went in front in the 17th minute. A misplaced back pass fell to Dan Mason and the big striker shrugged off Harris’s challenge to slot past Ant O’Connor. That was the first time that Town had conceded first in a home league fixture this season. Town were not firing on all cylinders in the first half and there was worse to follow as Bourne Town went further ahead six minutes before the break. It was Mason again who met a cross from the right with a looping header that found the top corner of the goal. Town huffed and puffed to try and get a goal to give them a lifeline before halftime but it was not to be. Arron Parkinson and Andy Marks asked for a response in their halftime team talk and they got one ten minutes after the restart. King cleverly got himself between the ball and the keeper and was brought down. He stepped up to smash the ball home from the ensuing spot-kick. Town made their first change with Elliott Lamb Johnson returned to the action following a knee injury to replace Jordan Orosz. The equaliser arrived in the 68th minute when Creaney got on the end of a long ball into the box and smashed the ball home. Sam Heavey and Alfie Taylor were replaced by Gilligan and Scott Sandy. And Town won it in the 80 minute, King was brought down on the edge on the area and Gillingham took the free-kick, finding the bottom left corner to spark wild celebrations on the pitch and around the ground.